I set up a new Ookla server on my Mac Mini. Everything was working well, but the server would not start automatically upon boot. My goal was to run this headless, so I wanted to be able to plug it in and fire it up without having to log in and start the daemon manually. After much research, I found the way to do it, and will share the code I used. This particular Mini is running OS X 10.9.5 Mavericks. Assuming you have installed the LAMP package and Ookla server and licenses, we will proceed to add the daemon to OS X.
OS X uses the /Library/LaunchDaemons files to start daemons as the root user. Once the file is created in the /Library/LaunchDaemons folder, we can add to the launchctl list (use sudo, so the daemon is run as root). You can also view the list. 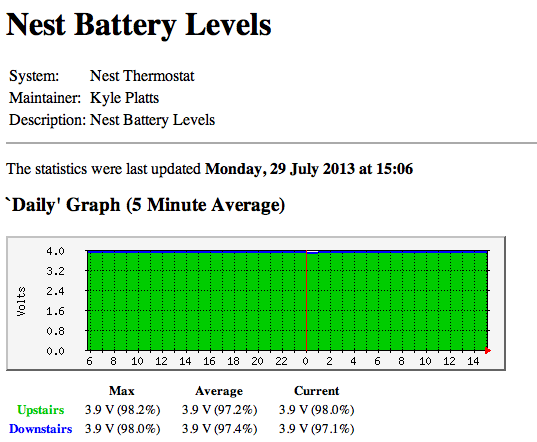 Since mine is running, it also shows the PID. To stop the daemon from loading, do the following. Special thanks to Alvin Alexander for the tips to get this working! Here’s a 1 Gig speedtest via GPON to my Mac Mini Server. I ran into an interesting problem last week, and I found very little information on the internet about it. I will share it here, in the hope that it will help someone else. Working with a newer product, I created a 10 Gig Link Aggregation configuration on my Cisco 7609 WS-X6708-10GE cards. When I added the second link to the group, the Cisco kept putting the link into an alternate group! I searched the web for any indication of what the A meant on the end of the port-channel group, but I came up empty. All I knew was that my config looked good, and the Cisco would not add the second link into the group. The only thing I could find about this “alternate” group was, “if something on the other end doesn’t match exactly, the Cisco will declare the link in a new group”. Armed with that little information, the search begins. Doing a ‘show lacp neighbor detail’ gave me the information I needed to find the issue. As you can see, the System ID’s for each link being reported in the LACP protocol do not match. Now, in this case, this is true, as the end device is in a multi-chassis LAG configuration. In order to work with the Cisco, the System ID’s must match. The Alcatel 7750 does not do this check. Changing the System ID, allows the lag group to come up. I spent some time recently creating some new graphs for a special project. It’s an 8 pair ADSL2+ EFM boded group. There were several items that I had to use that are not what you would call “standard” MRTG options. The following are some of the things I had to do to make everything work and display correctly. The particular OID’s I am using are 64 bit counters. By default, MRTG uses SNMP v1, which cannot read 64 bit counters. By specifying 5 colons and a 2 on your target, you are telling MRTG to use SNMP v2c. These particular Enterprise OID’s are split out into Unicast, Broadcast and Multicast bytes. In order to get the total traffic, all the OID’s must be added together. No problem! MRTG can do that. Simply specify your first 2 OID’s, then use the + sign to add them together. In this case, I am adding 3 sets of OID’s together. Transmit and Receive counters for Unicast, Broadcast and Multicast. Once you do any arithmetic on the OID’s, MRTG no longer grabs the router uptime. You must add router uptime to the configuration file to get the router uptime to display properly again in the graphs. The timezone of the unit under monitor and the server are different. In order for the times on the graph to be accurate, you must override the server locale with that of the unit under test. MRTG uses the Solaris 10 locale’s to determine timezones. Here, I am using Mountain time. Since these are ADSL2+ physical links, the train rates for transmit and receive are different. MRTG can handle this too! You must specify what the transmit and receive link speeds are, so MRTG can calculate the percentages correctly. This is done by using the MaxBytes1 and MaxBytes2 parameters in the config file. Take the EFM group bitrate (144,752,000 bps) divided by 8 to get 18094000 BYTES/s and 6,464,000 bps divided by 8 to get 808000 BYTES/s. MRTG will also show a line on your graph to indicate the uppermost bound of the lower speed link. This makes it easier to read. This is the continuation of my previous post where I talked about setting up my Nest Thermostat. Since Nest does not offer an open API, we have to cheat a little (ok, a LOT!). By using Scott Baker’s Python code, you can query the Nest web service to get your current status on the Nest (using your nest login, password and serial number). Data is sent from the local Nest to the web. Python is used to grab the data from the web and put into my own MRTG compatible format. From the Nest data, I am graphing Temperature and Humidity, Heating/Cooling State and the Battery Levels for each of 2 thermostats. This is all done using a perl program that creates an array from the Python program output, parses the array line by line, then creates a file that MRTG can read to do the actual graphing. This perl script runs every 5 minutes on my Raspberry Pi to create the files needed for MRTG. Heating and Cooling states are converted to either a 1 or 0 for graphing. Temperature is in degrees C, but being an American, I have no frame of reference to what C feels like, so I convert it to Fahrenheit. I also make sure all of the values are mulitplied by 100 so I can graph with 2 decimal point accuracy. In the MRTG config file, I use Factor and Y-ticks Factor to gain 2 decimal point granularity in my graphs. Since these are static values read each time, there is no need do math and figure out the “rate” of a digital output of the thermostat. You will see the use of gauge, nopercent and absolute on the states. I do maintain percentages on humidity though, since that is what is calculated by the thermostat. These are the files that actually contain the data parsed from the web and and are read by MRTG for graphing. Each file needs 4 lines. The first line is Value 1 (In) for MRTG. Line 2 is Value 2 (Out). Line 3 contains the Uptime if you choose to display it. Line 4 contains the graph title. 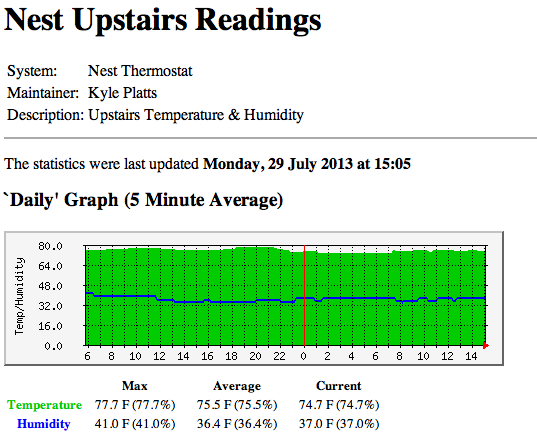 This indicates that right now, my upstairs Nest is 74.66 degrees F with 37% humidity. 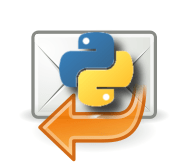 One of the easiest ways I have found to create automated email messages is to use the Python SMTP Library. The code is pretty straightforward and allows you to send attachments. Using a gmail account, allows email to work whether you have a local SMTP server installed and running or not (more portable). On my last project, I am using MRTG to graph some traffic OID’s, but the server does not have Apache installed, and even if it did, it’s firewalled with no access to Port 80. To compound matters, I do not have control over the server, as it belongs to the customer. How to get those pretty graphs out to the rest of the world? I investigated several ways of removing the data from the server, TFTP, FTP, SCP, etc. 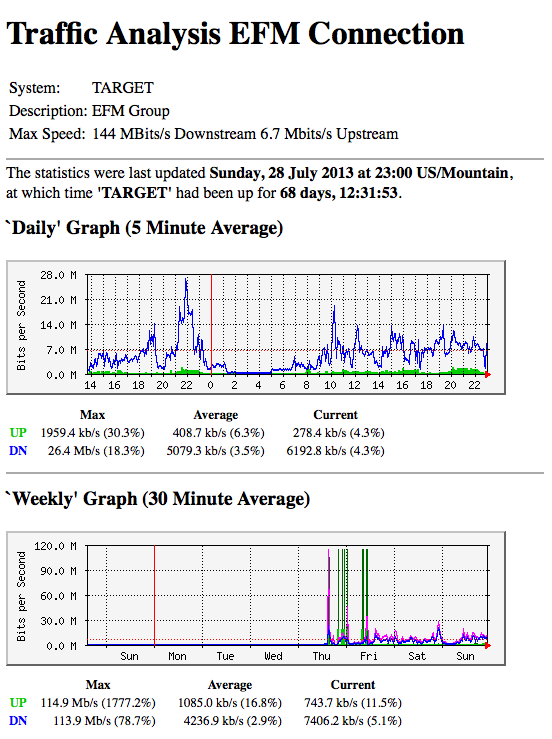 the goal was to email the graphs to the interested parties, so why not just email directly from the server? The files are already there, and MRTG creates the HTML for me on the fly. Luckily, we do have Python installed on this server that is being used for some other tasks, so I decided to use the SMTP Library. I’ve used this library in past projects to do email attachments, so I was familiar with how to use it. What I had not done, was change the message body to HTML. I found an example on StackOverflow and used it as the basis to start coding. If you just import the MRTG generated HTML file, the email will come through with attachments, but it won’t display them properly in the email client. What I wanted, was an exact duplicate of what would be seen on a webpage. I went back to another project to look at how the images were attached. # email clients that don't want to display the HTML. # Define these once; use them twice! In the above code, the body is already in HTML, so reading in the MRTG generated HTML file is pretty straight forward. However, images are referenced using a Content ID. The original MRTG HTML file does not have this present. Since we have to read the MRTG HTML from a file anyways, why not add the cid: to the image source in the HTML? This now creates the appropriate Content ID within the HTML message so all the images are displayed inline. This is an 8 pair ADSL2+ EFM bonded group running at 144 Megbits/s downstream and 6.7 Megabits/s upstream. As our lives continue to move to the cloud, it is more important than ever to maintain strong passwords. Here I will show you some easy tricks to creating strong and easy to remember passwords. Being a child of the 80’s, I remember Gary Coleman’s popular show called Diff’rent Strokes. His catch phrase, “what you talkin’ about Willis?” is a great start to a strong password. By creating an acronym out of that catch phrase, we create a unique word that is not in the dictionary, but is also easy to remember. To make it stronger, we can arrange the acronym with alternating upper and lower case letters. We now have a non-dictionary word with upper and lower case letters. Add numbers to make it stronger. Using this process, we now have an extremely long (13 characters), non-dictionary, contains upper case, lower case and special characters password. Sure to meet the requirements of even the strictest IT departments. Use one, any or all of these tricks to create your own easy to remember secure password. My wife got me a Nest thermostat (www.nest.com) for Christmas. I had it installed later that day. 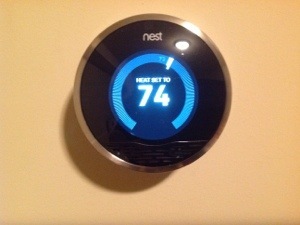 For those of you who don’t know, the Nest is a learning thermostat with wireless capabilities. It has the capability to learn a schedule for you, lower the temp when you are away, and allow access remotely. It is slick! Setup was a breeze. Once on the wireless network, I created my Nest account and I was good to go. 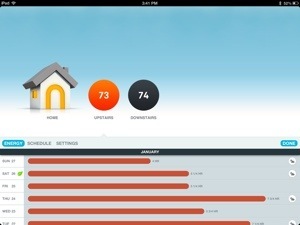 I loaded up the client on my iPad and I can now control my Nest from anywhere in the world. 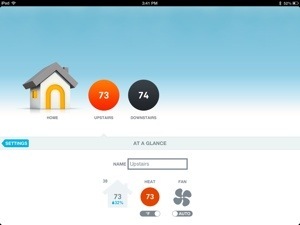 The Nest has a daily energy use report so you can see what is happening in your house. It keeps track of the local weather too, so it knows if it was a warm or cold day. This is my favorite screen. It shows you all the data in one screen: inside temperature, outdoor temperature and humidity. 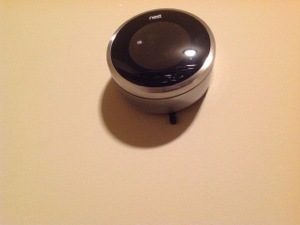 Here are a pair of pictures of the Nest installed. You can see my Dallas 1-Wire sensor hanging out underneath it. 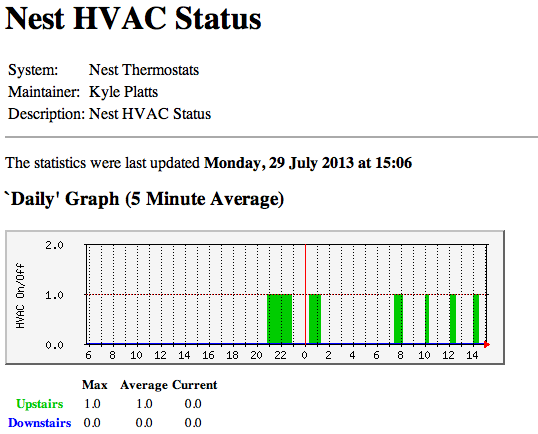 I liked the Nest so much, I had to buy a second one for downstairs to run the hydronic floor. With my Arduino monitor, I could see that the difference in air temp would cause the floor to turn on. With 2 Nest’s, I am able to run the same schedule on both, so when the air temp drops overnight, the floor doesn’t run unnecessarily. With the use of Scott Baker’s Nest.py program (Python API for Nest) and a little bit of Perl code, I can monitor the Nest’s in MRTG. The Nest does not have a published API, and it does not repsond to SNMP queries, so you have to query the web to get data, rather than query the device sitting on your local network. I hope Nest will open this up to developers at some point. Here is the data flow. Having lived with my monitoring system for a little over a month, I can say that I found this project to be very fun. I now can see when and how long each of the hydronic floors is active and the temperatures around the different parts of the system. From the data I have collected, I was able to experiment with the pump speeds. Each pump has three speeds. Monitoring the outlet and inlet temperatures showed that using the lowest speed left the most heat in floors. Previously, from my seat of the pants experience, it seemed that the middle setting was better, but the data shows that it is low and slow that works better. My house has in-floor radiant heat installed in both the basement and garage floors. I’ve always wondered how often and when the circulator pumps run. I investigated getting some hour meters to see how much time accumulated for each pump, but most hour meters are run off of 12 Volts, and the pumps are 120 volt AC connected to 24 volt AC thermostats. Doing some more investigation, I found an Arduino microcontroller could be used to monitor the pump status quite easily. Arduino is an 8 bit microcontroller powered by a 16 Mhz ATMEL ARM processor. Each Arduino contains several General Purpose Input Output pins that you can use to connect to various devices and sensors. The more I looked into the Arduino, the more capabilities I found it had. You can quite literally do anything with an Arduino! 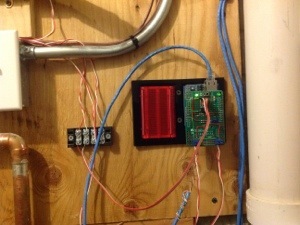 My original idea was to use an Arduino Uno to monitor the 24 volt AC that controls the relays to the pumps. I had to get an optocoupler to connect 24 volt AC to an Arduino friendly 5 volt DC signal. I purchased a dual optocoupler and started to breadboard a circuit. Once I was satisfied with the circuit, I moved it to a prototyping shield and soldered it all up. 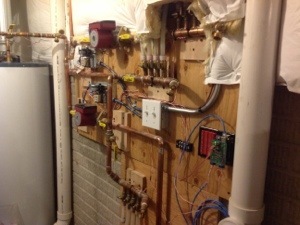 The initial build was to include 2 temperature sensors, one colocated with each hydronic thermostat using the extra wires to the thermostats. I originally looked at using analog temp sensors, but I was concerned that the long cable runs would skew the readings. I then decided on the Dallas 1-Wire digital temp sensors. Using a single pair of wires, it is possible to power and read the sensors on a bus. You simply attach each additional sensor to the bus. 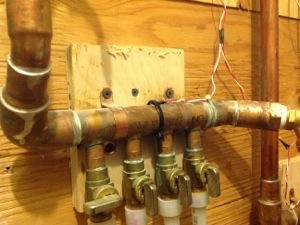 I found another blog post that showed temperature sensors epoxied to the water pipes in a solar heating set up. This gave me the idea to expand the system to monitor not only the ambient temperature, but also the inlet and outlet temperature of each zone and the boiler. Rather than using epoxy, I had some thermal compound left over from a PC project, so I used it to thermally bond the temp sensor to the water pipe. I used zip ties to mechanically mount the sensors to the pipes. This seems to work quite well, as the temp sensors are consistent with the mechanical temperature gauges installed in the pipes. The next step was to determine how I wanted to monitor all of the inputs. From my research, it looked like the Arduino is usually hooked up to a host PC or an ethernet sheild is used. Being the network professional that I am, the ethernet shield was my first choice. Having decided upon ethernet as the transport protocol, I found an ethernet shield with Power over Ethernet built in! This allowed me to run just a single Cat 5 cable to the Arduino, and I didn’t have to get AC to the wall. The most popular method of accessing data on the Arduino is to create a web server. While looking into the web server, I found an SNMP package. Once I saw I could do SNMP to the Arduino, I decided to go ahead and use MRTG to monitor the inputs. 4 birds killed with a single stone!